Triphala is an essential feature of Ayurvedic medicine that has lasted for thousands of years. Triphala, or triphala churna, is an herbal concotion derived from the dried powder of three fruits. In fact, the term “triphala churna” literally translates as “three fruits powder” in Sanskrit. The ancient formula is commonly touted as the most effective and versatile of all, and the purported triphala health benefits are seemingly endless. Triphala contains compounds with antioxidant, anti-inflammatory, antibacterial, and antidiarrheal properties. As a result, the potential benefits include treating cancer, cleansing the colon, and reducing cholesterol among others. This article will explain why triphala should be on your list of beneficial supplements. Triphala comprises three fruits: amalaki, bibhitaki, and haritaki. Triphala powder is made of equal parts dried powder of each medicinal fruit, and the three fruits also correspond to the three doshas of Ayurvedic medicine. Amalaki is an excellent source of vitamin C and bioflavonoids, and it is used to support intestinal repair; treat fever and the common cold; and as a digestive, diuretic, liver tonic, restorative, laxative, and anti-inflammatory agent. In particular, amalaki is effective for balancing the Pitta dosha. Bibhitaki is another potent ancient rejuvenator known for its detoxifying qualities. In Ayurvedic medicine, bibhitaki is used to support the respiratory system, and treat hypertension, diabetes, and rheumatism. Evidence also shows that bibhitaki extract may inhibit the progression of atherosclerosis plaque. Also, bibhitaki benefits the Kapha dosha. Haritaki is also known as harada. Although it is effective for all three doshas, it is particularly useful for calming and provides anti-inflammatory benefits to the Vata dosha. Haritaki helps treat diabetes, constipation, dementia, nervousness, anxiety, and high blood pressure. It is also known for its antispasmodic properties. Also, its “scraping effect” is useful for moving toxins and maintaining a healthy weight. What are the health benefits of triphala? Triphala contains strong antioxidants ellagic acid, chebulinic acid, and gallic acid, and various polyphenols and flavonoids. Many apply triphala topically to the skin to accelerate the healing of sunburns and bruises. Eye and hair washes often contain the mixture as a tonic. 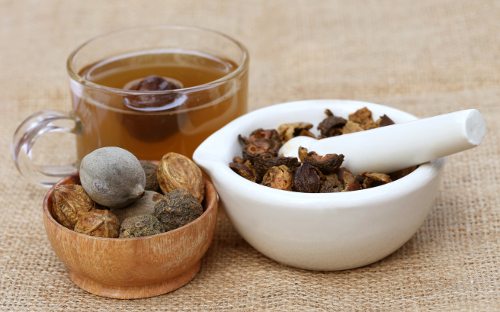 Here are three more reported triphala health benefits. Natural laxatives like triphala tend to be gentler than the over-the-counter types. Triphala will also nourish the digestive tract, produce regular bowel movements, and cleanse the colon naturally. Colon cleansing will positively impact the nervous system, and may fight anxiety and fatigue as a result. The amalaki also supports intestinal repair; the bibhitaki pulls the old mucus from the intestinal wall; and the haritaki works to strengthen intestinal muscles for efficient bowel movements. On study published in the Journal of Ayurveda and Integrative Medicine in 2011 found that a herbal laxative formula containing triphala extract, senna extract, and isabgol husk was effective and safe treatment for constipation. A study published in the journal BioMed Research International in 2015 found that triphala extract induced cell health and suppressed the spread of human colon cancer stem cells. The researchers also found that the methanol extract in triphala contains various cancer-fighting phenolics, such as isorhamnetin, quercetin, homoorientin, and naringin. Research has also shown that the gallic acid in triphala has promising anticancer activity against prostate cancer cells. The anti-cancer abilities of triphala may also promote the death of tumor cells and spare normal cells. Cholesterol is crucial in healthy amounts for proper function of hormones, the immune system, the brain, nerves, and cells. The Western diet, which relies on processed oils, animal products, and refined carbs, contributes to high levels of harmful cholesterol. Cholesterol combines with calcium, fat, and other substances in the blood to create plaque. Plaque buildup, or atherosclerosis, can lead to stroke, heart attack, and heart disease. A study published in the Journal of the Pharmaceutical Society of Japan in 2007 found that animal subjects treated with triphala had significantly lower total cholesterol and LDL (low-density lipoprotein) cholesterol, or the “bad” cholesterol. Want to know how to take triphala? Triphala powder, tablets, liquid extract, or capsules are available at your local health food store or online. Just make sure you purchase from a reputable vendor. It is best to take triphala on an empty stomach, and it is possible to ingest it in a variety of ways. Triphala powder: Drink as a tea with a half-teaspoon of powder and a cup of hot water. Liquid triphala: Take 30 drops in juice or water, one to three times daily. Triphala capsules: Take once or twice daily before eating food. For digestive laxative and tonic purposes, triphala is best at night—at least 30 minutes before bedtime. Whatever form of triphala you take, it’s important to follow the dosing directions on the packaging. And it is always wise to consult with your health care provider first to find out the best dosage for you. Although there are many triphala health benefits, there are a few things to consider when using the supplement. Nursing or pregnant women, children, and those with diarrhea or taking blood thinners should not use triphala. Triphala may cause side effects like increased gas and diarrhea due to the detoxification effects and cleansing of the digestive tract. Reduce the dosage or discontinue use if these occur. Watch out for signs of dehydration such as excessive thirst, dizziness, or muscle weakness. Stop using triphala if you have any of these symptoms. It is also a good idea to check with your health care provider before using triphala if you are taking other medications or have frequent health problems. “Triphala,” Banyan Botanicals; https://www.banyanbotanicals.com/info/ayurvedic-living/living-ayurveda/herbs/triphala, last accessed March 13, 2017. Carver, L., “The Benefits of Triphala,” The Chopra Center; http://www.chopra.com/articles/the-benefits-of-triphala, last accessed March 13, 2017. “Triphala,” LifeSpa; http://lifespa.com/ayurvedic-supplement-facts/triphala/, last accessed March 13, 2017. “Triphala Powder: One of the World’s Most Potent Herbal Remedies,” Triphala Powder Benefits; http://www.triphalapowderbenefits.com/, last accessed March 13, 2017. “The Remarkable Qualities of Triphala – A Famous and Revered Ayurvedic Formula,” VPK by Maharishi Ayurveda; http://www.mapi.com/ayurvedic-knowledge/digestion/ayurvedic-benefits-of-triphala.html#gsc.tab=0, last accessed March 13, 2017. Singh, J., “Triphala Churna (Powder) Benefits, Uses, Dosage & Side Effects,” Ayur Times, March 16, 2015; https://www.ayurtimes.com/triphala-benefits-uses-dosage-side-effects/, last updated Dec. 21, 2016. Vadde, R., et al., “Triphala Extract Suppresses Proliferation and Induces Apoptosis in Human Colon Cancer Stem Cells via Suppressing c-Myc/Cyclin D1 and Evevation of Bax/Bcl-2 Ratio,” BioMed Research International, 2015; 2015:649263, doi: 10.1155/2015/649263. Saravanan, S., et al., “Hypolipidemic effect of triphala in experimentally induced hypercholesteremic rats,” Journal of the Pharmaceutical Society of Japan, February 2007; 127(2): 385-388. https://www.ncbi.nlm.nih.gov/pubmed/17268159. Hamid Kamali, S., et al., “Efficacy of ‘Itrifal Saghir,’ a combination of three medicinal plants in the treatment of obesity; A randomized controlled trial,” DARU Journal of Pharmaceutical Sciences website, 2012; 20(1): 33, doi: 10.1186/2008-2231-20-33. Kalaiselvan, S., et al., “Triphala exhibits anti-arthritic effect by ameliorating bone and cartilage degradation in adjuvant-induced arthritic rats,” Immunological Investigations, 2015; 44(4): 411-426, doi: 10.3109/08820139.2015.1017047.